PARIS (Reuters) - Emmanuel Macron ripped up the French political textbook with surprising ease last year, but repeating the feat in Europe next year is a tall order when there are decades of perceived French arrogance to overcome. Pieyre-Alexandre Anglade, Macron's European election emissary, has a front-seat role in persuading parties from across the left-right divide to rally behind the president's drive to redraw the landscape and make Europe relevant again. 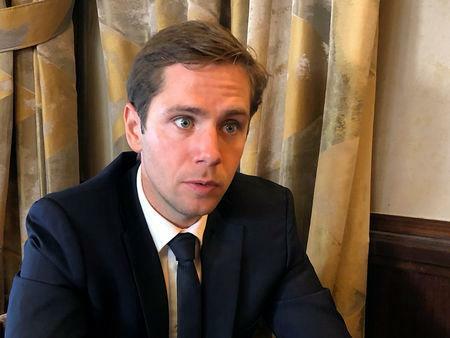 "Creating trust in politics takes time, creating trust in European politics takes more time, but creating trust in European politics when you're French takes even more time," the 31-year old soft-spoken lawmaker told Reuters in an interview. Macron, who paints next May's European elections as a battle between progressive, pro-EU reformists and populist, far-right nationalists, is out to break the old left-right duopoly that has dominated European politics in recent decades. He has tasked Anglade with seeking out future alliance partners from the existing conservative European People's Party (EPP) and centre-left Progressive Alliance of Socialists and Democrats (S&D), as well as the smaller centrist ALDE group, to form a new movement inside the European Parliament. "We see the system as dysfunctional and it needs rebuilding, but there's no arrogance in our approach, we're not here to say we'll destroy everything because we're the best." For all the professed humility, Macron is attempting nothing less than a brutal reshaping of the current political order in Brussels, just as he achieved in France, and a direct challenge to Europe's most powerful leader, Germany's Angela Merkel. Merkel and Macron have forged a strong relationship, Anglade said, dismissing the suggestion Macron's election strategy may put him on a collision course with the German chancellor, who is keeping faith with the EPP. But he acknowledged Germany was "the most complicated issue" for the coming elections. "Obviously, from this point of view, our interests are not necessarily aligned," Anglade said. If Macron's future alliance is able to edge out the EPP to become the biggest grouping, it would hand him more influence over the pick of top EU jobs and more influence on EU legislation. No small feat for someone who only two years ago set up his own movement and blew apart France's two-party system. Macron's lieutenants have held talks with Italy's centre-left Democratic Party, which currently sits in the S&D group, and European Council leader Donald Tusk's Civic Platform in Poland, which is aligned with the EPP. They have also met the leaders of Spain's centrist Ciudadanos and Guy Verhofstadt, the leader of ALDE. On Thursday, his party chief Christophe Castaner penned an opinion column in European newspapers with Italy's former prime minister Matteo Renzi, Verhofstadt and others. "We must act now, or the European project will stall. Worse, it could be suffocated by nationalist and populist forces," they co-wrote. Anglade said Macron's movement Republic on the Move (LREM) and ALDE shared "intellectual proximity". "But if we want to become the number one force, or a major force in the European parliament, we need to go beyond the ALDE base and be able to rally political parties which were once in the EPP, the Socialists or the Greens, in a new structure." "There are a certain number of parties which went to the EPP or the Socialists at one point, not because they were conservatives or Socialists, but because that's where power was and how you got posts," Anglade said. Macron has not designated a leader for his European ambitions and in another challenge to Brussels has said he will not present a "spitzenkandidat" - a group's candidate to become the head of the European Commission. "The spitzenkandidat today is a man or a woman named by a political party in a dark room in Helsinki, Riga or wherever, who has no strong legitimacy," Anglade said. Macron will seek businessmen, professionals and political novices to run for parliament on his party's national ticket, just as he did in France last year, Anglade said. Brussels has often been seen as a place to send political has-beens and candidates who failed at home. "We won't send the losers of the 2017 legislatives. And we won't send those we're fed up with in Paris to exile in Brussels," he said.